Hi loves! Today I am sharing the newest Colors by Llarowe collection with you. The Spring 2016 collection is a special one, as it is a tribute to a dear friend of Leah Ann who has been struggling with cancer and is in her last days. There are times in life that we find a person who inspires us. Even though I have never met Helen as she lives an ocean away, she is my hero. I always thought life was just a means to an end and that life was a painful journey with rich rewards at the end. I was wrong. Helen has shown me that I need to treasure each and every moment here on earth and to live as if tomorrow will never come. Helen finds joy in the smallest moments and even in adversity. She is and has been battling an illness with grace, dignity and a zest for life I have not seen before. She reminds me that there are challenges in life that show us what is really important and how to meet those challenges head on and never give up. My outlook on life has changed dramatically just from knowing this wonderful lady who is as beautiful on the inside as she is on the outside. Thank God for you Helen, it is an honor to be called your friend. This collection was inspired by your spirit, your heart and your wonderful soul. A portion of the proceeds from this collection are being donated to Helen's charity: https://www.willowfoundation.org.uk/donate. Colors by Llarowe Did You Know You're My Hero? is a muted bright blue crelly with intense pink to gold to red shimmer. It's an opaque polish that still allows the sparkle to shine through properly. I used 2 coats and topcoat. Colors by Llarowe Helen is a muted creamy turquoise crelly base with intense pink to gold to red shimmer. This is very similar to Did You Know You're My Hero? and personally I would have liked a darker blue or a grassy green in this collection instead of 2 almost similar shades. It's another lovely formula that only needs 2 coats for opacity, finished with topcoat. Colors by Llarowe Life is a Highway is a magenta pink jelly with scattered holo and magenta and purple iridescent micro glitter. This one needs to be seen in real life to really appreciate it! It needs 3 coats to build up, at 2 coats it was a bit too... flat. Colors by Llarowe Miss You My Friend is a light sky blue intense linear holo with silver micro flake. My lighting set-up really emphasizes on the holo and the silver sparkle, making it appear very metallic, but without direct light it's a softer polish with an intense sparkle. I used 2 coats and topcoat. Colors by Llarowe On The Wings of Eagles is a charcoal taupe crelly base with intense pink to gold to red shimmer. This is very beautiful, there is a certain warmth to it and the shimmer stands out so good against the base. I used 2 coats and topcoat. Colors by Llarowe Pretty in Pink is a bright pink intense linear holo with pink, cherry and rose holo micro glitters. Such a happy shade, perfect for Spring! The holo is quite strong but still allows for the glitter to be seen. Easy formula, I used 2 coats and topcoat. 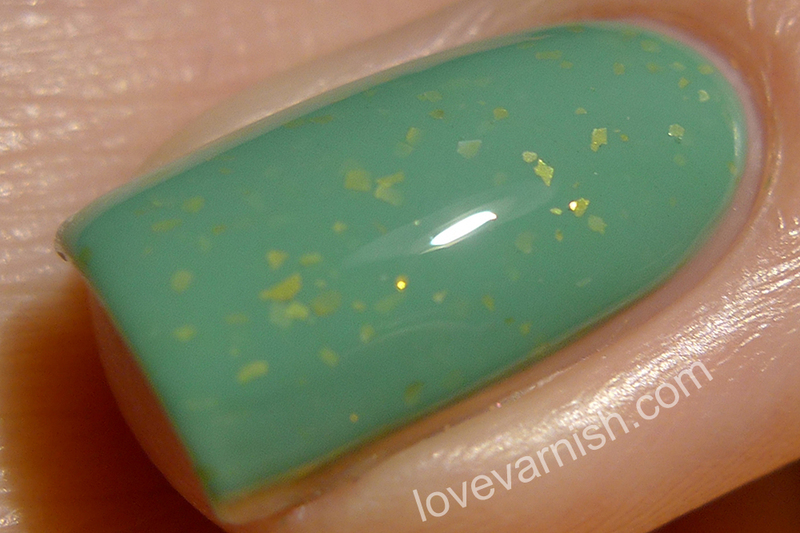 Colors by Llarowe Rare Jade is a jade green crelly base with gold flake. The flake in this polish looks as if it is floating between the layers. I like to build up these colors a bit to get more depth, so I used 3 coats, but you could get away with 2 I think. The flakies were easy to work with. Colors by Llarowe You Make Me Smile is a bright almost neon pinky coral soft linear holo with blue/purple shimmer. Very warm in tone and very unique, I don't think I have anything similar in my stash! It was very creamy and easy to apply, I used 2 coats and topcoat. This is a very pretty collection, with some gorgeous finishes and unique colors. I'm a bit torn on the fact there are 2 very similar shades included, but they are beautiful so that makes up for it a bit. My favorites are Helen, Life is a Highway and On The Wings of Eagles. What do you think of these 8 shades? And which one is your favorite? Tell me in the comments! The Colors by Llarowe Spring 2016 collection is set to release April 1st as a pre-order from 12PM - 8PM MST. For more information check the Colors by Llarowe Facebook page linked below!